The functional gadget that keeps your boiled egg clear of shell fragments. This complete egg lovers set is constructed from top quality stainless steel. 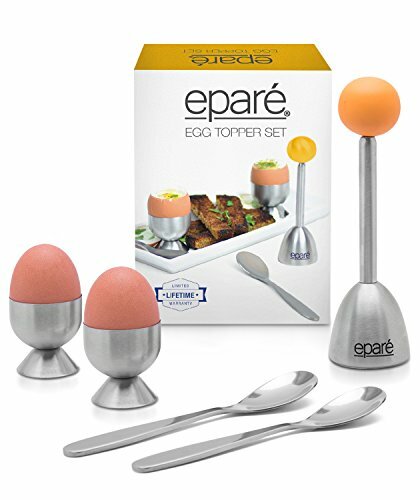 Includes Egg Topper, 2 Egg Spoons and 2 Egg cups for your favorite soft or hard boiled eggs. Pull ball up and release, the spring mechanism will cause a vibration to the sharp edge in the dome and score the shell. Perfect egg shell cutting. This topper may be used on both raw or boiled eggs; raw eggs for baking or simply to fry. Carefully nudge when pulling up and the egg shell will remove with the topper, or just raise with a nudge from the egg spoon. Prepare to serve the perfect soft-boiled egg. Use with the egg cups and egg spoons top your egg with salt, chives, and serve with a side of toast points. If you have any questions about this product by eparé, contact us by completing and submitting the form below. If you are looking for a specif part number, please include it with your message.